Rainy afternoon at 5PM. Two people with cough, cold and sinusitis ready to develop into full-blown flu. To go straight from work to home should be a good idea. 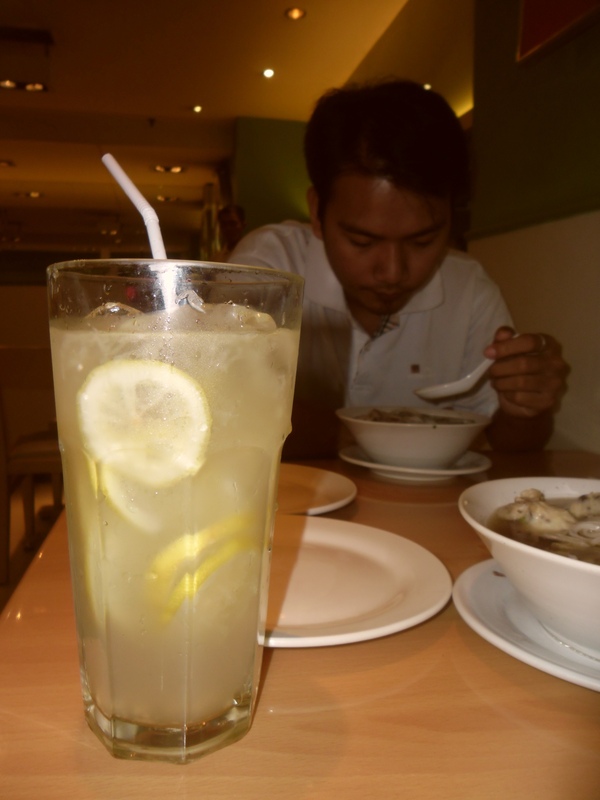 They decided a hot soup of ramen and freshly squeezed citrus drink should do better. 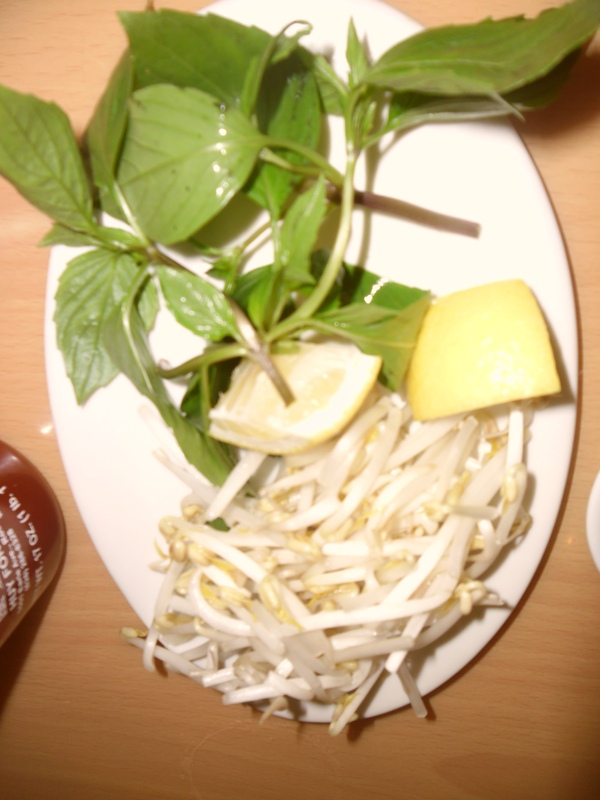 Pho Hoa- though I first thought it to be a Chinese restaurant, serving noodles with a store located near Luk Yen (a real Chinese restaurant)- is a casual dining Vietnamese restaurant. I heard nice reviews regarding it and it’s accessible inside a mall so we decided to give it a try. We ordered a large bowl of one of their best sellers. The menu says its Pho nam, chin, gan, bo vien or flank brisket tender and meatball pho. The noodle is white and tasted differently from the usual yellow egg noodles. It tasted fine to me. What I didn’t like so much is the beef. I t doesn’t tastle like beef at all to me because of its bland flavor, pale color and weird texture. Luk Yuen’s is so much better I my opinion. What we loved is the freshly squeezed lemonade. It tasted just right and was very suitable with the cold we’ve been having. The lemonade we loved best. 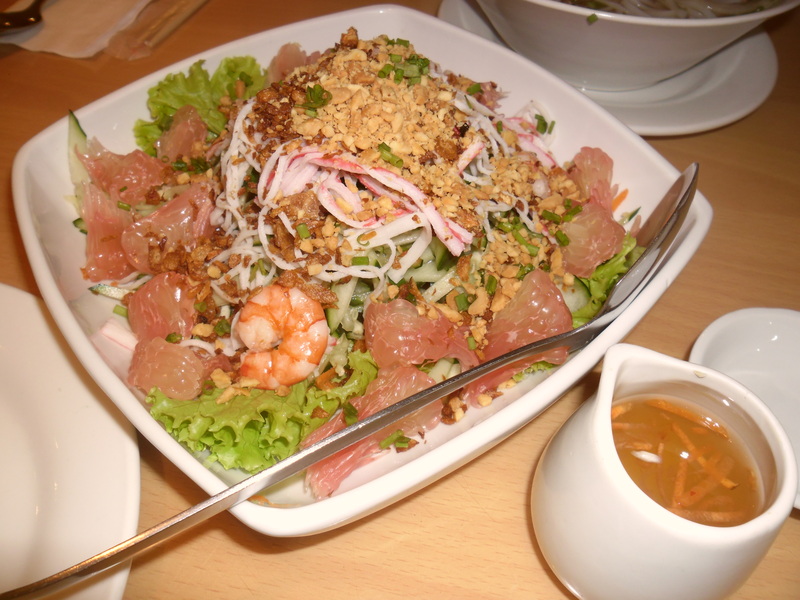 We also later decided to order Goi tom buoi or pomelo shrimp salad. They serve orders pretty fast. This so much made up from the beef noodles with the great combination of the nuts with the crab meat and cucumber and their special dressing. The servings are good for 2-3 persons and since our appetite weren’t that high that afternoon we had the left-over food packed for take out. They placed the food in plastic and brown paper bag which we thought would break when we were around five meters away from the store. We decided to go back and ask for another paper bag when lo and behold! The waiter who assisted us handed me my digicam which I accidentally left on our table. It might be because of the flu or plain blind spot on my part because I checked our seats and table before leaving. Pho Hoa scored on customer service to me at that point. The free appetizer. Another score.